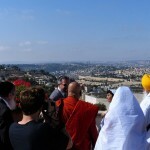 Jerusalem, September 13, 2016 — A delegation of Asian religious leaders visited the Hebrew University of Jerusalem today to hold a day of discussions at the Harry S. Truman Research Institute for the Advancement of Peace. The leaders met with their Israeli counterparts from religion and academia to exchange ideas on issues ranging from the advancement of peace to the protection of environment. 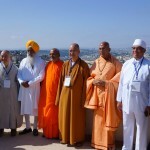 The delegation included representatives of the Buddhist, Hindu, Jain, Shinto, Sikh, Taoist and Zoroastrian faiths, from countries including China, India, Japan, Myanmar, South Korea and Taiwan. The meeting opened with a prayer and meditation session, followed by discussions about safeguarding the ecology of planet earth in the industrial age, and the role of religious leadership in peacemaking. 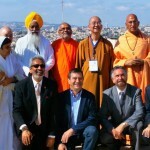 The meeting was part of “Ancient Traditions, Contemporary Realities: A Meeting of Israel-Asia Faith Leaders,” a first-of-its kind conference organized by the Israeli Foreign Ministry, the American Jewish Committee and the World Council of Religious Leaders.